for the non-Apple Part of this Equation? SPECIAL REPORT: News/Feature (6.20.07)-- Yesterday evening was the ten day countdown to the iPhone's release and just shy of that exacting mark (an hour and a half shy), a visit to an AT&T owned and operated Cingular Wireless store garnered some interesting information-- what AT&T's stake is in this ball game, especially when the key player in the all-star game is Apple Inc.
We've been hearing a lot about what Apple plans to do with their iPhone in terms of marketing and the like. With the iPod at its core, the whole "halo effect" of the iPod leading to more sales of Mac hardware and converts from Windows/PC land could possibly have the same effect. Except now, it's a cell phone contraption that doubles as a mobile internet device and will also be a music and video capable iPod. That idea was discussed in a commentary piece last week in regard to iPod this, iPod that. In fact, we tried to get some details from an Apple Store employee last night after the Cingular Wireless visit, but as is always the case, the employee only shared what the public already knows: that the iPhone will debut on June 29th, and that they will be available at the store. They directed us to go to Apple.com to find the latest information on the iPhone. In reality, the employee did say that they only know what Apple corporate tells them. Which is either truly nothing at all--which wouldn't be so far off, in order to keep the shroud of secrecy--or maybe they do know something but have been told to not divulge the details. The former seems to be the case in all bets. By the same token, when trying get in contact with Apple PR / Media Relations, through experience, you'd best be talking to a wall since they always "decline to comment" as a reputable Mac-related magazine puts it. Truth is, they don't even comment at all. 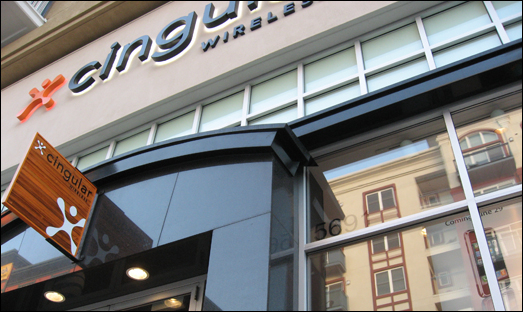 Even though the Cingular name was still plastered on the outside of the store, this one was clearly an AT&T owned and operated location. (As pointed out yesterday by MacUser.com, stores with the "AT&T" moniker are just that, while those that still have the "Cingular" brand are franchise stores. Research beforehand showed this store location to be, thankfully, an AT&T store that just hasn't made the name change yet).